Jolly good, Mate! Tackle multiple missions in comfort and style, without paying an arm and a leg. 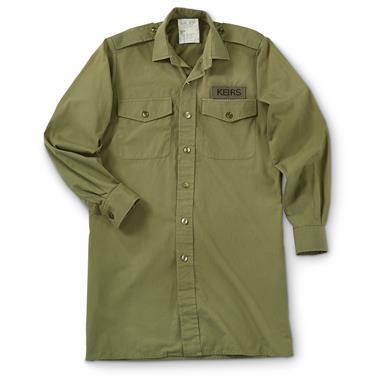 These Field Shirts rank high among British troops, and they'll serve you well, too. British Military Surplus Long-Sleeve Field Shirts, 3 Pack, Used is rated 4.4 out of 5 by 16. Rated 4 out of 5 by Jack from Good price, sizing is bad These shirts are thick, warm, and overall great quality. Though used, they showed no visible wear and a very mild amount of fading. I don't know what everyone else is getting, but these were huge. I wear a 34 in pants which is the high end of medium according to the size chart, yet the shirt almost reached my knees and was easily big enough around for 2 of me. Rated 5 out of 5 by Cliff from Great bargain on quality field shirts! All three of mine were in solid shape--one was missing a pocket button and another a cuff button. I took the odd button off the pocket issue one and sewed it on the cuff of the other to complete it. Fit was Euro military accurate--I wear a 16 neck, 34/35 sleeve shirt and these fit well in size large. Good material and color with little/no wear. I'll use them mostly to fish and for yard work. Rated 5 out of 5 by TKD Dan3 from Fantastic Shirt Great shirts! I wear them as casual everyday shirts. I wear a US military large, regular shirt. I am 6', 180 lbs. They fit me perfectly, even sleeve length. Well made shirts with quality light cloth. All shirts were in new condition. One even had a rank insignia on the sleeve. Very cool. Very long in length, but not obnoxiously so. Rated 5 out of 5 by Niccolo from Great Deal All three were in very good condition with minimal wear. Well made and comfortable. Rated 5 out of 5 by Winter Camper Al from Something for everyone Brit green, not brown. One seems new, high poly content; one used, soft & cotto--ity, excellent condition; one quite used with corporal stripes & name tag--its faded green is really the handsomest color! Great value, S.G.! Rated 5 out of 5 by OF73 from Excellent These are superb mil surplus shirts. Forgot what quality was? Get some of these and remember. Shirts run small by US sizes. Get one size larger. Washed up nicely, held creases in sleeves. Don't miss out, get a 3 pack. Varied from like new to used but serviceable. Rated 5 out of 5 by Giff66 from Good Shirts I like the material used in these shirts. They should be good for working outside or going to town.